I was lucky to have the good fortune of growing up in the Fingerlakes region of New York. With gorges, waterfalls, forests, and more readily available in close proximity to just about anywhere you go, it’s a hiker’s paradise. Every time I think about my hometown (Ithaca), that becomes completely obvious all over again. And if hiking isn't your thing, some of my favorite state parks have plenty to see without much walking at all. Even spending an hour or two at one of the state parks in the area is a perfect way to recharge, especially during this time of year. It's impossible to pick a favorite when it comes to the many beautiful New York State Parks in the Fingerlakes, but when a friend recently asked me where I'd recommend going as a visitor this summer, it was clear these three are among my top go-to options for day trips and overnight visits. If you're a waterfall fan, Buttermilk Falls State Park is close to paradise. I stop there every time I go home, even if it's just for a few minutes. Located just south of Cayuga Lake in Ithaca, New York, the park is named for beautiful, cascading Buttermilk Creek. The creek flows over multiple rock formations and ends in a natural pool, perfect for cooling off on a summer day. Buttermilk Falls is the largest of ten falls along Buttermilk Creek, and a handful of hiking trails give visitors the chance to see them all when they're open in warmer months. My favorite trail in the park is the strenuous Rim Trail, which takes hikers straight up the valley and back down in 1.6 miles. You can also create a loop with the Gorge Trail, which winds back down the other side of the creek. The trails are only open from April through October, as the winters in the Fingerlakes can make trails icy and slippery. If you're there in the off-season, you can admire the falls from the parking lot. If you're not sure whether trails will be open or not, contact the park office for the most up-to-date information. The park also seasonally offers dozens of campsites and cabins, but be sure to reserve in advance. The region is incredibly popular in the summer. And if you're coming during peak season, be sure to bring the requisite $8 per car for parking or get yourself an Empire Pass Card. Check the Fees & Rates section of the page for more information. Another incredible example of the effects of glaciers on the Fingerlakes Region, Robert H. Treman State Park‘s gorges and waterfalls are a must-see for anyone exploring the area. In addition to its unique geological features, Treman is also home to a 19th century mill, a variety of bird and animal species, and plenty of recreational opportunities. I have many a fond memory of swimming in the lifeguarded swim area under Enfield Falls, hiking the Gorge Trail, staring at 115-foot Lucifer Falls, and picnicking with my family. Most of the park’s trails are inaccessible in winter and closed from October through April, though the park is open year-round. Give the park office a call if you're visiting in the off season or shoulder season for more information. The lifeguarded swim area, clearly a highlight of any visit to Treman, is generally open during the months of July and August. If you’re planning a visit and hope to include gorge swimming (highly recommended), be sure to visit during those summer months. Camping is also a popular activity in the park, but be sure to reserve sites ahead of time. As with Buttermilk Falls, a day visit to the park with your vehicle will cost a minimum of $8 unless you have an Empire Pass. If you’re impressed by the height of Niagara Falls, you’re sure to be even more impressed by Taughannock Falls. Dropping over 200 feet from top to bottom, Taughannock Falls carves through sandstone and shale, both which crumble easily, making the gorge quite a site, and ever-changing. 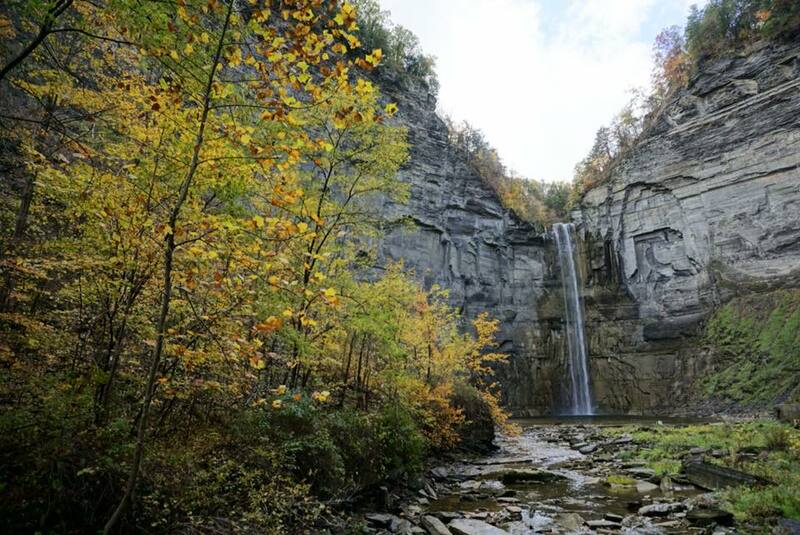 According to New York State Parks, Taughannock is the tallest waterfall east of the Mississippi. The Gorge Trail is a quick, easy ¾ mile flat walk straight to the base of the falls, but the North and South Rim Trails (2.6 miles in total) are my favorites for hiking; both are strenuous, but reward hikers with spectacular views. Taughannock Falls State Park is open year-round, but depending on conditions, trails may be closed in the off season and shoulder season. Call the park office for more information. Autumn is an ideal time to visit; the changing leaves with Taughannock Falls in the background is a breathtaking sight. 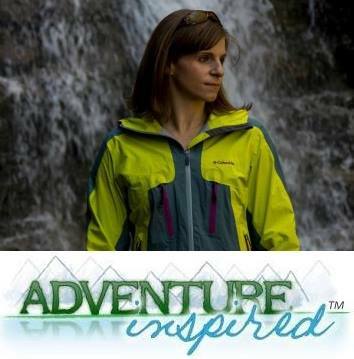 Camping is also available seasonally, and as with Buttermilk Falls and Robert H. Treman State Park, the fee to park is $8 per car unless you’ve got an Empire Pass. 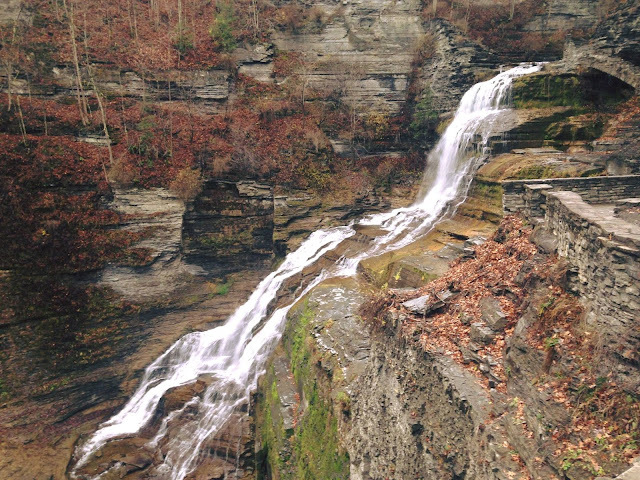 If you hadn't already noticed a theme in the parks I've written about, just in case, I'm absolutely in love with the waterfalls in the Fingerlakes Region of New York State. If you've been to any of these parks, or have others you'd recommend visiting, I'd love to hear from you in the comments!